Are you the person who can’t say no? Do you get mad at yourself that you have ended up doing something that you don’t want to do / don’t have the time to do just because you didn’t want to say no. Ask yourself what are the reasons you are doing it for? Recognise what it is that is driving you to say yes. Once you have realised your reasons for previously feeling like you have had to say yes. Be clear on your boundaries on what requests you will say no to. Do you have a work colleague that takes you too much of your time & it is impacting on your results at work? Do you have a family / friend that demands too much of your time? Just say no: Come up with an honest & respectful way to say no – “I would love to help you….I don’t have time with all that I am doing right now.” “I’m not going to say yes this time”. “That doesn’t work for me, so I’m going to say no”. You don’t need to give loads of reasons for your decision to say no. Set up criteria for saying yes the next time: Where you have a recurring request, you can set up the criteria where you would say yes to it. “If you give me more notice (a day’s notice….a week’s notice) I can see how I can help you out next time…. e.g. If you call me 3 days in advance, I can help you out, however on Wednesday afternoons I’m never available because we have our team meeting. Teach don’t do: Where you have someone who keeps on asking you the same thing over and over again – Show them how to do it rather than keep on doing it for them, this will eliminate the request so you don’t need to say no to it. Remember that changing an old habit requires practice, it is said to take 66 days to make a new habit. I think it takes 66 times to make it a new habit. 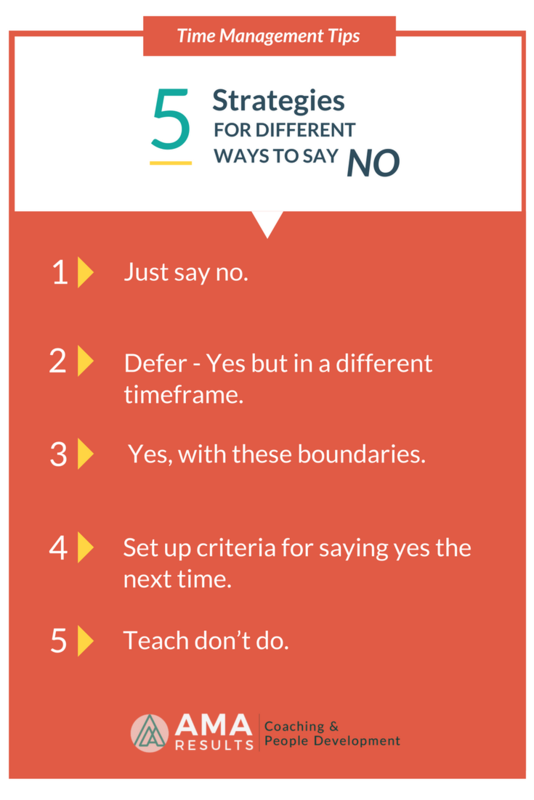 So if you are someone that always says yes – consider some of the things that you want to say no to. Practice some of these strategies & let me know how it goes for you.